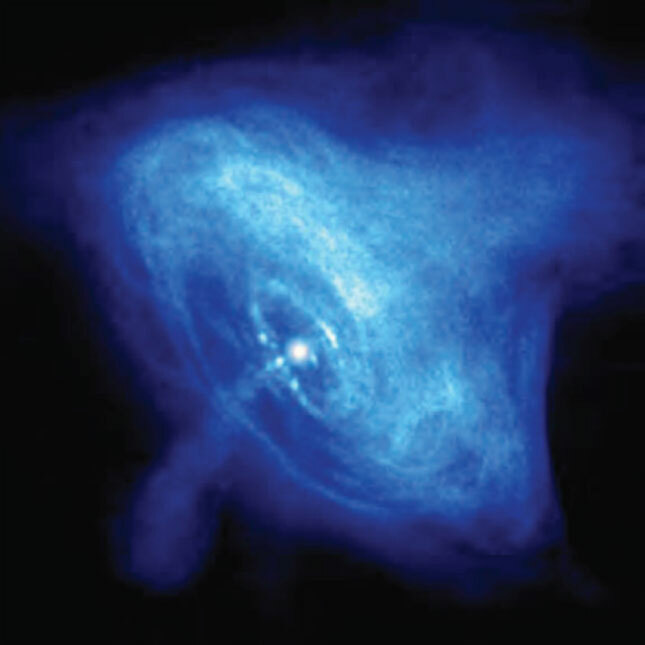 The Crab Nebula pulsar, a theoretical neutron star. Credit: NASA/CXC/ASU/J. Hester et al. A University of Michigan press release announces "warped space-time" around a so-called "neutron star." Could electricity provide a better explanation? The smeared lines of an iron spectrum have given NASA and University of Michigan astronomers another mystery to solve when it comes to explaining the universe. Using the XMM-Newton and the JAXA/NASA x-ray observatories, high-velocity particles in orbit around Serpens X-1 seem to indicate relativistic effects. "This is fundamental physics. There could be exotic kinds of particles or states of matter, such as quark matter, in the centers of neutron stars, but it's impossible to create them in the lab. The only way to find out is to understand neutron stars." Part of what they are trying to understand is the observation of spectral lines from "hot iron atoms" that appear to be orbiting close in to the surface of the neutron star. As interpreted by conventional theory, the spectra indicate that some of the material is moving at over 40 percent light-speed. Since iron atoms glow at certain optical frequencies when heated to their incandescent state, there should be dark lines within the specular distribution of the color bands. Called Fraunhofer lines, they mark places within the spectrum of any material where the emission energy is absorbed, leaving a dark line within the band of color generated by a prism. Because Fraunhofer lines are supposed to occur at specific frequencies identified in the spectrum by the kind of element that is being absorbed, if they are in a different location, then they have been Doppler-shifted because of their acceleration. This forms the backbone of galactic-scale distance calculations and the supposed speed of recession that the galaxies display. Using this system of "redshift" some galaxies are measured to be moving away from Earth at an unbelievable 90 percent of light-speed. The velocity assumption is derived from a gravity-only version of the cosmos. A supermassive object composed of tightly packed neutrons is the only mechanism that could provide the gravitational strength needed for the iron ions to achieve such fast orbits. In a previous Thunderbolts Picture of the Day (click below image), an analysis of neutron stars revealed that the science behind their hypothetical existence does not support the very idea of such objects. As we have previously written, a foundational concept in nuclear physics is the "island of stability." Plotting the number of neutrons against the number of protons in the nuclei of all elements demonstrates that the ratio is about one-to-one for light elements and one-point-five-to-one for the heavy ones. An atomic nucleus outside the range will spontaneously decay so that it reaches a stable configuration and remains in equilibrium. If there are too few neutrons, the atom will emit protons in order to stabilize and vise-versa. A nucleus - or star - composed of neutrons alone would be completely unstable and would immediately decay. The hot iron that has been found around the Serpens X-1 stellar phenomenon is most likely the result of electrical discharge action on and around the star. Stars exist as anodes in a galactic circuit that causes the majority of them to blaze in arc mode. which contains a neutron star and a stellar companion. 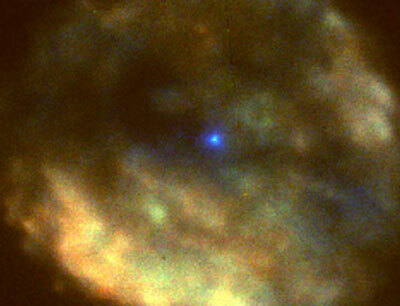 just beyond the neutron star’s surface at 40 percent the speed of light. 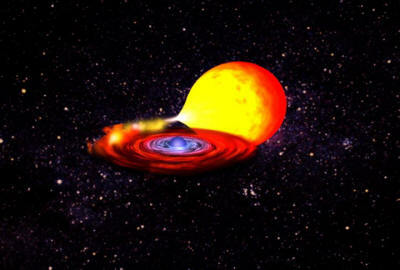 Many neutron stars are accompanied by a companion star, as portrayed in above illustration. which then settles into a slowly in-spiraling disk around the neutron star. No "millions of continuous H-bomb explosions" are taking place at the core and the observational data leads to the conclusion that they are actually giant balls of plasma. The information gleaned from the Hinode spacecraft and other science experiments observing the sun has confirmed that understanding. If we continue to invent ad hoc conjectures to save theories that do not directly explain new observations, then we will never discover the true nature of the "thunderbolt that steers the heavens."